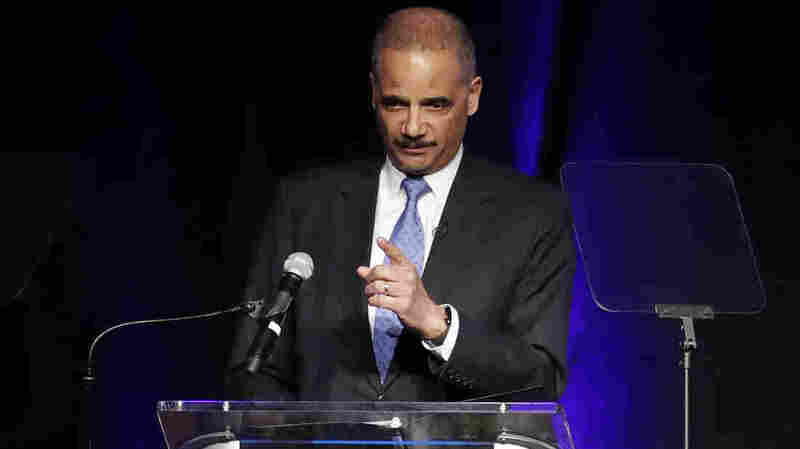 Former Attorney General Eric Holder Visits Iowa, Weighs 2020 White House Bid The former Obama AG will decide whether he's running in the next two weeks. The speech he plans to give certainly sounds like the building blocks of a possible campaign to challenge President Trump. Former Attorney General Eric Holder speaks at the Peabody Hotel in Memphis, Tenn., in April 2018. Former Attorney General Eric Holder travels to Iowa on Tuesday as he weighs whether to join a growing field of Democrats seeking the presidential nomination in 2020, and he's expected to make a decision in the next two weeks, NPR has learned. Holder, who served for six years under former President Barack Obama, will make a decision on a White House run in the next two weeks. Meanwhile, the speech he plans to give at Drake University Law School in Des Moines certainly sounds like the building blocks of a possible campaign with a heavy condemnation of President Trump. "We should be dissatisfied with an administration rife with corruption, stunning incompetence, and shameful intolerance," Holder will say in his speech, according to prepared remarks. "Most of all, we should be dissatisfied by that same administration's total abdication of moral and policy leadership — and its failure to address the many other urgent challenges we face: A democracy that's under attack. A climate crisis that's ignored. And racial and cultural divisions that are weaponized and exploited for political gain." Holder will recall his visits before to Iowa in 2007 "on behalf of a long-shot presidential candidate who had inspired me with his optimism and his vision for our country." And the former attorney general will talk about his upbringing — the grandson of immigrants from Barbados and son a of a World War II veteran and the racial discrimination he and his family faced throughout the years. "I am dissatisfied – just as so many of you are dissatisfied – with the inequities that continue to divide us, the injustices all around us, and the refusal of some elected leaders to rise to this defining moment," Holder will say. "That's why I cannot be silent — and I hope you won't be silent — as our nation confronts this time of challenge and consequence." Should Holder choose to mount a 2020 presidential run, it would be the first bid for elective office by the career prosecutor, who served as deputy attorney general under President Bill Clinton and then assumed the top job under Obama, when he became the nation's first African-American attorney general. While leading the Justice Department, he made civil rights and voting rights a major focus. When Holder first floated the possibility of a White House bid last year, it took many by surprise. Since leaving the Obama administration in 2015, he rejoined a private law practice and also chaired the new National Democratic Redistricting Committee, designed to help Democratic candidates in key state races and to challenge gerrymandering ahead of 2020 redistricting and reapportionment. Holder will talk about that work and the importance of voting rights and an accurate census count during his speech Tuesday. "Intolerance and cynicism may appear to be gaining strength — but that's simply not the case when our elections are fair and the true spirit of our people is accurately reflected," the former attorney general will say. "The bad news is that — in far too many places — elections are not fair. The system is being rigged by politicians who are willing to bend or break the rules in order to stay in power." If he runs for president, the fact he was the first sitting Cabinet member in history to be held in contempt of Congress over his role in the bungled gun-trafficking operation known as "Fast and Furious" is sure to be brought up. He also helped Democratic candidates in the 2018 midterm elections, though he stirred controversy for saying "When they go low, we kick 'em" while on the campaign trail in Georgia — a riff on former first lady Michelle Obama's 2016 mantra "When they go low, we go high." Holder later had to clarify he wasn't advocating violence. Holder seems to make a possible allusion to that sentiment in his remarks, closing with a push for change. "Together, we must call out — and throw out — public officials who seek power by bringing out the worst in us. Now in that effort we must seek civility — but not at the expense of truth telling or the protection of treasured principles," Holder will say. "The fact is: America is at its best when we face difficult questions and hard truths. America is at its best when we open our arms — and widen the circle of opportunity — for everyone who loves this country enough to make it their home." 'Watch What We're Doing': Could Maryland Gov. Larry Hogan Challenge Trump In 2020?